The sun is still shy to rise as a large, heavy-bottomed pot meets the blue-orange flicker of flames, and a mixture of beef bones and pork trotters rain down with bruised lemongrass to commingle in a sauna of onions, ginger, fish sauce, and pineapples. Skilled hands carefully skim the foam gathering at the rim. Thai chilies, clove, star anise, and black cardamom join the bubbling broth. Rich, aromatic steam humidifies the kitchen as the chef moves methodically between tasks, preparing beef shanks, brisket, and knuckle bones. She tastes the stock. Decades of muscle memory—taste memory—flavor this broth. There is no shortcut to the perfect balance achieved by the proper breakdown of collagens, fats, and muscles, with infused herbs and spices. The addition of annatto oil, shallots, and chilies brings forth the heat and sultry scarlet color. Most importantly, fermented shrimp paste provides the deep umami and slight sourness that bring balance to the force. The backbone of this soup—and its main ingredient—is time. But not just hours of simmering, the condensing of flavors—centuries of trial and error passed between dynasties and peasants. Grandmothers and grandchildren. Chef and cook and apprentice. The flavor of many generations. As the pots stew away for hours, finely julienned banana blossoms, red cabbage, and water spinach are piled onto small, pastel plates. Thick rice noodles are boiled until springy and toothsome. Thinly sliced beef shank, trotters, congealed pork blood cubes, fried tofu, and chả lụa (a Vietnamese-style pork sausage) are added to large bowls. Ribbons of white onion, scallion, and cilantro join. The magical broth is ladled over the ingredients until they are drowned in the elixir and served with crisp bean sprouts, medicinal herbs, sinus-clearing green chilies, tart lime, and, if lucky, additional shrimp paste to adjust the funkiness of the bowl to your liking. Far off, a bell rings as the bowl hits the pass. Hands clasp the blistering bowl, and feet shuffle in an ancient dance, choreographed to perfectly avoid spilling a single drop. The bowl slides gently in front of you. Steam rises to caress your face as you dip your spoon into the crimson broth. As it reaches your lips, oxytocin floods your bloodstream, and for a moment, the world and all its cruelty melt away. You are alone with this ancient, secret soup. Congratulations. You have just been served a bowl of Vietnamese phở’s older, more aggressive brother: bún bò Huế. To translate, bún bò Huế literally means “vermicelli noodles and beef,” a soupy wonder that hails from the central Vietnam city of Huế. The translation isn’t exactly accurate. No two bowls of bún bò Huế are alike. Regional styles, family recipes, and adaptations catering to Western palates have all made the exact definition hard to pin down, including the addition of pork, tofu, and fish balls. I’ve seen it all, right here in the greater New Orleans area, all under the umbrella of bún bò Huế. Beat poet, writer, and traveler William S. Burroughs coined the term “naked lunch”: that frozen moment when everyone sees what is on the end of every fork. Or chopsticks, in this case. This is my naked lunch. Frightfully uninformed and massively naive, armed only with the lust of a man in love with soup, I embarked on an adventure in search of the perfect bowl of nourishment on a cold and wintery New Orleans day. In short, I couldn’t have been more unqualified: a corn-fed, land-locked Midwestern boy who had never tasted cilantro until I was 22 years old. What was I doing, crisscrossing through parishes to try to get a handle on exactly what makes this Far Eastern food item so satisfying? After several belly-busting months of consuming and documenting each bowl eaten, I’ve put together a personal Top 10. By no means should this be deemed definitive. I’m no expert in Vietnamese cuisine. I am not a chef. The villagers will rise with their pitchforks and call me blasphemous for excluding their personal favorites from this list. I am prepared for this backlash. Bring it on. I welcome any open conversation that shines a light on such an overlooked and delicious dish. We are lucky to have such a thriving Vietnamese community in New Orleans. 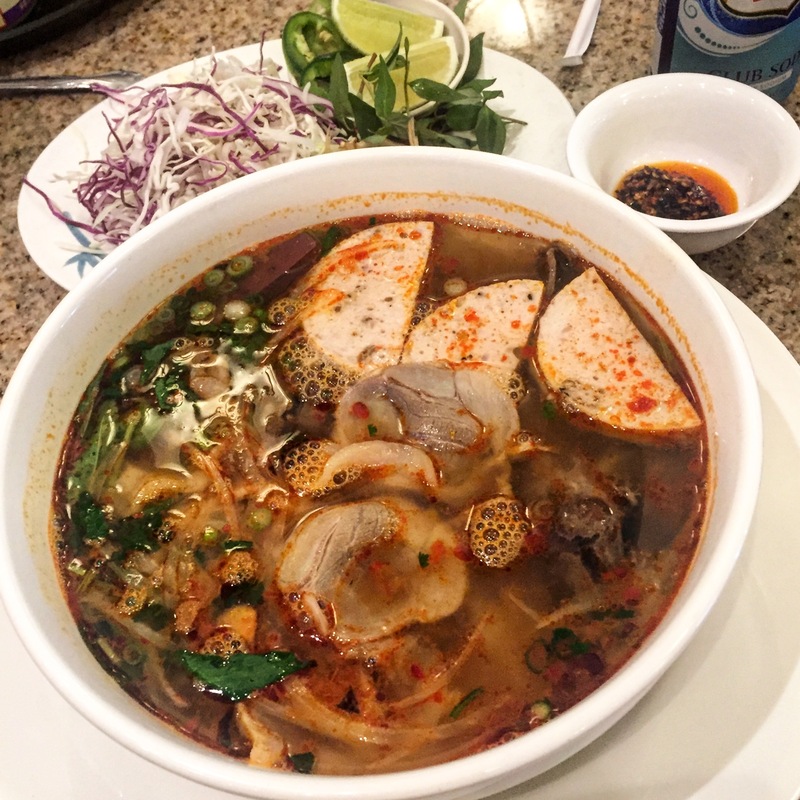 Just like the Canadian French brought their nouvelle cuisine to the swamps of Acadiana and created Cajun food, or how unmistakable African and Caribbean flavors are the basis of Creole cooking, the Vietnamese have greatly influenced the food in our city. What are the chances that Vietnamese bún bò Huế will be uttered in the same sentence as gumbo someday? Or that bánh mì will become as recognizably New Orleans as a roast beef po-boy with extra gravy, dressed? Unlikely? Yes. Undeserving? You tell me after you take my advice and order the bún bò Huế next time instead of that chicken phở. Let’s be adventurous. After a dizzying number of bowls, I can say without a doubt that TD Seafood & Pho House in Harvey is absolutely my favorite. At $8.75, this is a total belly-filler. The broth is heavy with lemongrass and has a deep shrimp-paste umami. It is beefy, with just the right ratio of fat and a slow, chili burn. The toppings are really the stars of this bowl. Traditional beef shank is whisper-tender. Hunks of tendon bob in the red broth, begging to be picked up with your fingers and gnawed on to get every last gelatinous bit. Fried tofu is a welcome addition, as well as the peppery and delicious chả lụa. Cubes of blood cake are plentiful. Don’t rush; this is a bowl to savor. It was like high school all over again. She walked through the shimmering banquet room in slow motion while the soft music of Vietnamese television filled my ears and the smell of grilling pork and boiling broths filled my nose. She placed before me a steaming bowl of scarlet soup. My heart fluttered. My hands went clammy. Confused euphoria set in as I stared into this seductive bowl; I knew it was love at first sight. Ba Mien makes one seriously satisfying soup. This bowl shines with oil, and the chilis float gracefully around massive chunks of blood cake. Garlic, lemongrass, and fish sauce all shine through. Thinly shaved beef melts on your tongue. Banana blossoms, perilla leaves, Thai basil, and red cabbage pack a unique and authentic herbaceousness as well as a balanced bitter element. If I could swim in this bowl, I would. I have a friend who calls me every time he gets a craving for bún bò Huế because he knows if I am free and able, I’ll be on the way to meet him at Tan Dinh before the phone even disconnects. I’ve probably eaten this bowl more than any other in New Orleans. The smaller size is huge, and the bigger one frightens me. The rich beef broth is thick and oily with cooked-down bones, and the pleasant acidity of lemongrass hits you immediately. There is a subtle heat that can be augmented by the self-service station of chili pastes and fish sauces. The trotters are the size of my fists and much meatier than others in town. The beef in this bowl is rich, and the addition of Vietnamese meatballs ensures you will have to loosen that belt a notch when you leave. 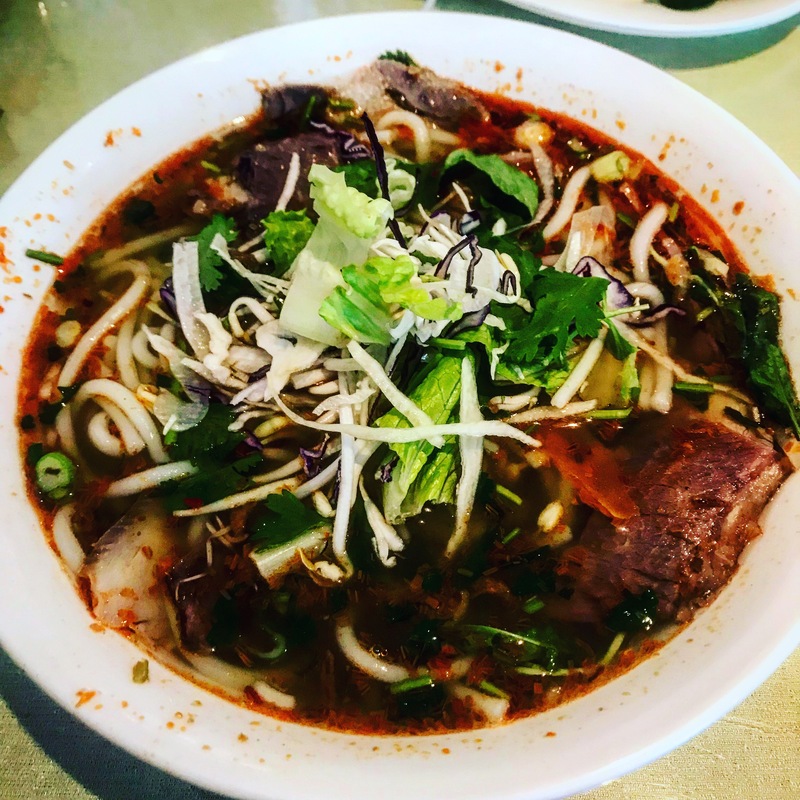 The first thing you notice when you get this steaming hot bowl of bún bò Huế is the bright, blood-red color of the broth. Your mouth begins to salivate as the aromatic steam bathes your face. Smells of grilled steak with a hint of sweetness fill your nose. You taste the crimson broth, and, to your surprise, it is not as spicy as it appears; instead, it is rich and heavy with a lusty, pleasant mineral taste. Marbled beef shank is the star of this bowl. The broth clings to the bouncy noodles. The addition of green leaf lettuce adds a bright crunch to the soup, along with the usual garnishes. 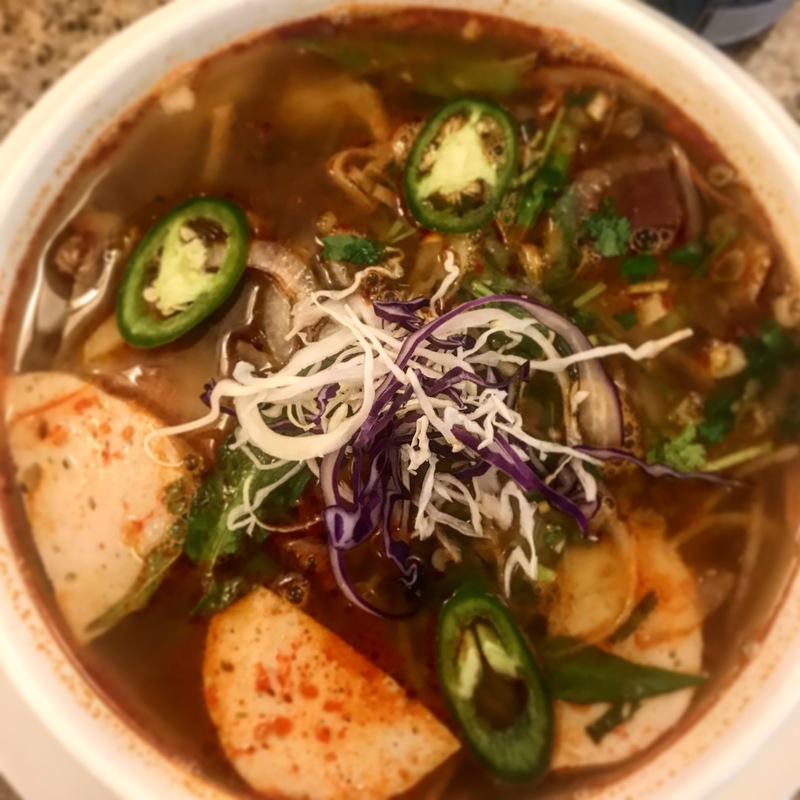 Pho Sunrise is tucked away in a strip mall, like many of Kenner’s best eats. But don’t let that dissuade you; it is worth the trip out west, brah. 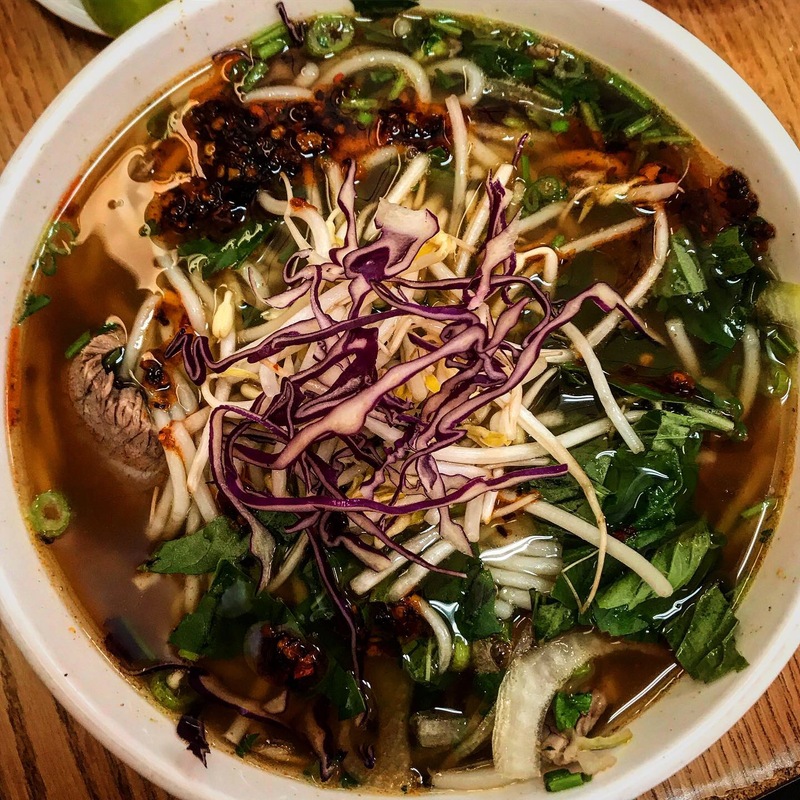 You may think you know Pho Bang. But you probably don’t really know Pho Bang. With four locations bearing the name in the New Orleans area, it’s tempting to pass up one because of the easy accessibility of another. But each Pho Bang, in my experience, has been completely unique. Nestled into a Vietnamese strip mall in New Orleans East, this Pho Bang stands on its own. The bowl of bún bò Huế appears simple—it is anything but. While they surprisingly don’t do blood cake here, they do make their broth with oxtail, giving the stock a certain richness that, on a cold day, can bring a tear to my eye. The meat in this bowl is the best in town. It flakes apart. It’s buttery. It evaporates on the tongue. It is a magic trick of soupy wonder. The texture of the noodles here is closer to wheat hand-pulled noodles than rice noodles, lending them a “slurpability” that rice noodles usually lack. Owned by Sisters Mung and Minh and named after the waterfall in the city where they were born, Pho Cam Ly produces consistently delicious food and has a warm, welcoming vibe that makes the family-run joint feel more like your grandmother’s house than a bustling restaurant on the trendy Magazine Street stretch. Simplicity reigns here. This is a great introduction to bún bò Huế for those apprehensive about taking the plunge off the phở deep end. There is no blood cake. No funky tofu. No pig’s feet trotting around this bowl. But there is the familiar beef, sliced so thin that it’s almost translucent. 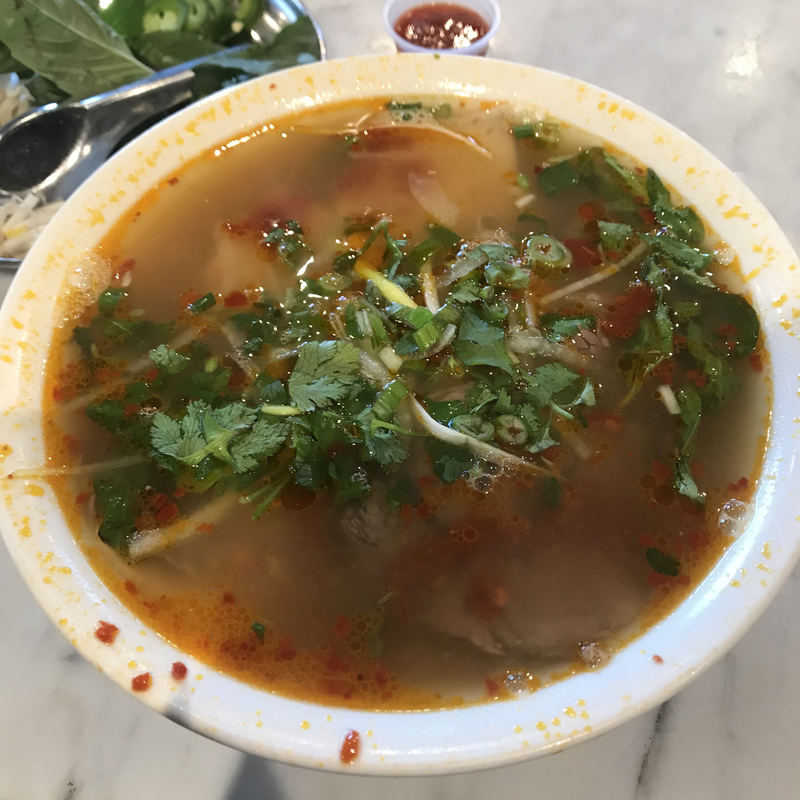 The tell-tale assertiveness of lemongrass and a hint of the sourness kick this bowl up a notch from normal phở, without being as aggressive as your uncle at the dinner table after a couple of Coors Lights. I say start here and work your way up to the beasts of bún bò Huế. And have a chat with the sisters; they are delightful. 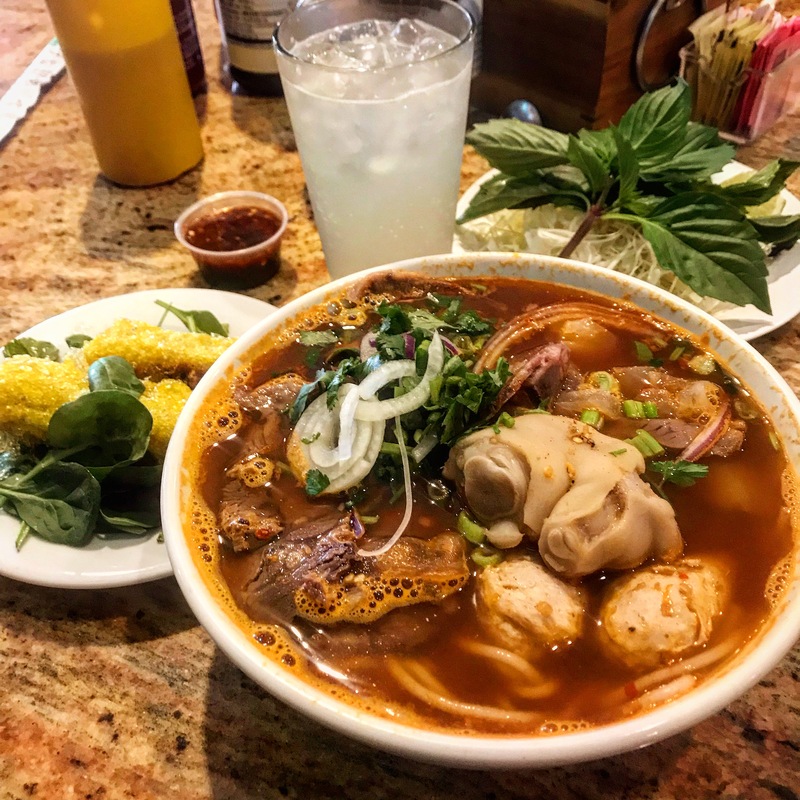 You can’t discuss Vietnamese food in New Orleans without including Pho Tau Bay: originally a stall in the Algiers Flea Market, then a beloved restaurant on the Westbank Expressway, and now a staple of Vietnamese food on the Tulane Avenue hospital corridor. 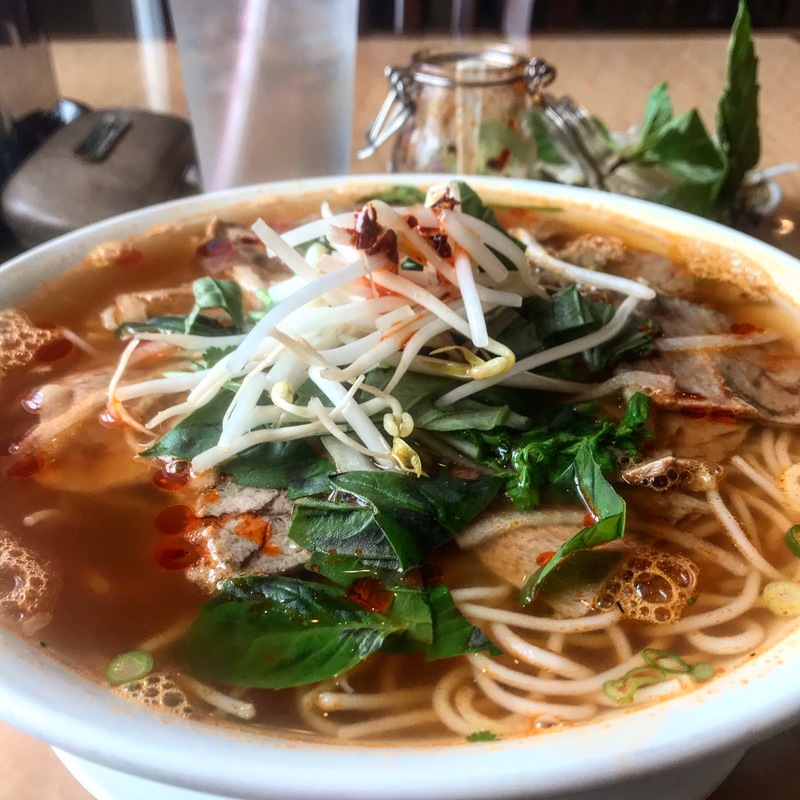 Pho Tau Bay was undoubtably an introduction to this spicy, sour, and sweet cuisine for the palates of many New Orleanians. The bún bò Huế here tastes like it is made with history mixed into the ingredients. It is unapologetically spicy, and the broth is heavy-handed with the fishy flavor of shrimp paste. To borrow a term from another cuisine, the noodles here shift toward a more al dente chew. The restaurant is fast-paced and filled with nurses, doctors, and business people slurping up noodles all hours of the day. 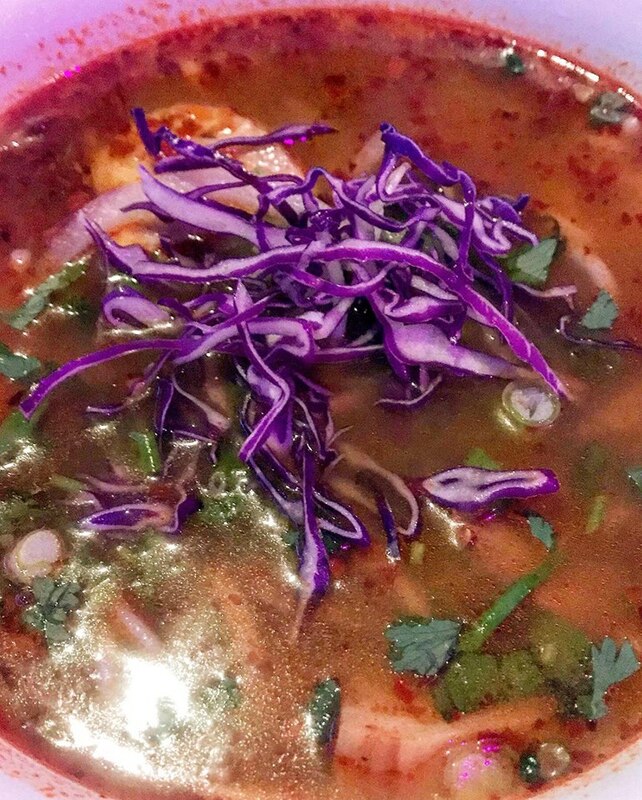 The savory and spicy broth will linger in your mouth, long after you pull the parking ticket off your car. And you will need a handful of napkins to dab the sweat that accumulates on your brow. It would be safe to say that most New Orleanians wouldn’t know that you can get more at this James Beard Award-winning spot than the cheapest, most amazing bánh mì and the creamiest, fluffiest king cakes. But why travel all the way out to the east without munching down on some bún bò Huế as well? For over 35 years, this restaurant has served the Vietnamese population in New Orleans East a taste of their homeland and has produced some of the best breads and pastries in town. But don’t fill up on steamed buns in the bakery; they make a MEAN bún bò Huế here as well—packed with trotters, blood cake, and peppery chả lụa. This is a murky bowl, just like the swamps and bayous surrounding the restaurant. It’s sweet, sour, spicy, and fatty. This bowl delivers on all levels. Next, go to the bakery and get yourself one of those awesome dragon cakes to take home. If you aren’t already shopping at Hong Kong Market in Terrytown, then you just aren’t living your best life. The market has the largest selection of international foods in the greater New Orleans Area, and you can get lost in aisle after aisle of sauces, noodles, fresh fish, meat, and produce. If all of that shopping makes you hungry, you are in luck. Saigon Noodle house sits directly outside the Market's sliding glass doors. The bún bò Huế here is fantastic and packed with fresh ingredients from the Market. They load up the chả lụa in this bowl. It is meaty and spicy. And the people-watching through the giant glass windows looking into the Market makes this spot a great place to pass an afternoon slurpin’ noodles. If I tell you about this place, I’ll have to kill you. No, seriously. Don’t go here. It’s a secret, and I shouldn’t even be talking about this dark little karaoke bar in a strip mall across from a Sewage and Water Board drainage canal that flows to the Mississippi River. I shouldn’t be telling you about the absolutely insane Vietnamese street food we feasted on in a smoke-filled room without windows. Or the spicy noodles we slurped. 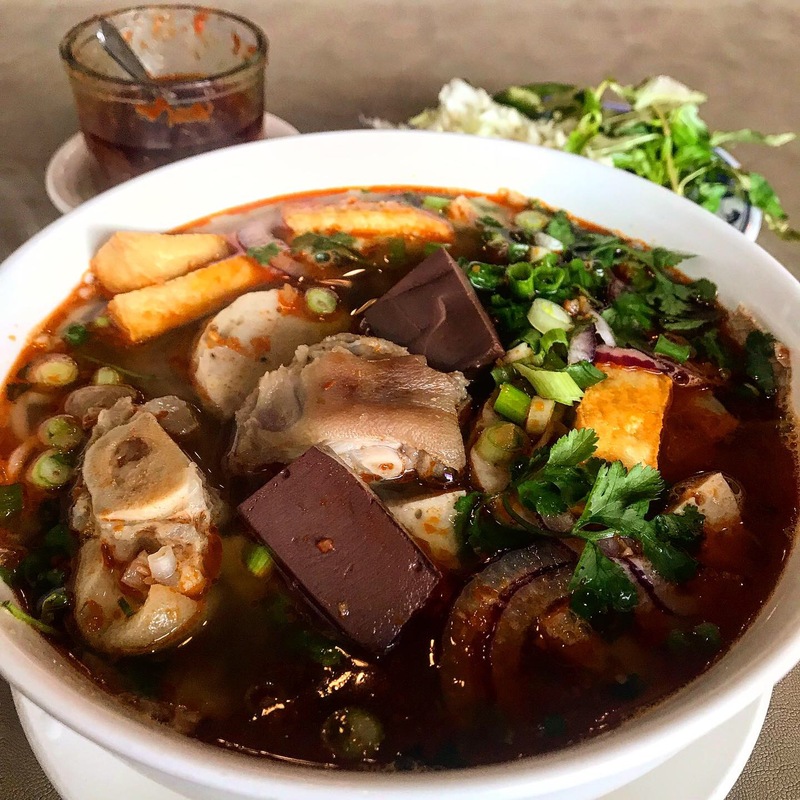 This hidden gem has one of the best bowls of bún bò Huế in New Orleans; it is aggressively spicy. This broth is as deep and complex as the words running across the karaoke screens. Perfect noodles, perfect broth.